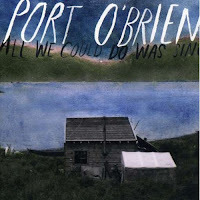 Port O'Brien is an folk indie rock band from California. I first heard of them during my interview with Kelly Winrich of Delta Spirit. Their album All We Could Do Was Sing was originally released May 13th, 2008 according to their website (Wikipedia reports 2007 with no source) and distribution on Amazon began today. The album caught my eye when I remembered Winrich's recommendation. Side Note: Interestingly enough I first listened to this album on the road to Austin, TX to see Delta Spirit at Emos in Texas' great capital city. Their bassist had been arrested for having his mom's prescription drugs on him on the way to their show in the Dallas/Fort Worth area (my fine home). They had to cancel their show. I couldn't miss them, so the Captain had no choice but to set sail. My first instinct when listening to this album was that you have to be in the right mood. If you are looking for energetic uplifting music you are not in the mood. If you are looking for chill music you can sit back and smoke (candy cigarettes of course!) to then you are in the right mood. The album begins with a happy anthem "I Woke Up Today" that features a chorus of the band's voices. It follows that with a much more subtle and passive song "Stuck On A Boat" with a rich folk flavor. The next song "Fisherman's Son" takes off where the first track ended with a chorus of voices. The sound of the chorus is comparable to The Polyphonic Spree (without the orchestra of ROCK!). Song #6 "Alive For Nothing" has a very sweet acoustic groove to it. If you aren't catching on, this album offers a lot of variety. It gets and keeps your attention. I like Kelly Winrich's taste in music. They may not sound like Pavarotti or Mannilow but this band's vocals are perfecto for the music. It is a passive, almost lazy but fun sound. The instrumentation is good, it just isn't great. There isn't enough variation in the instrumentation to match the ever changing music styles. The creativity in the album in oozing out at the seams. The melodies are superb. Each song has a chorus you can sing along to. This is a hard thing to grade. The production is purposely rough to match the music. For the most part it does, but a few tracks I think go too far. "Valdez" is an example. This is without a doubt, one of my favorite albums of the year. It's a really good effort from this band. I'm looking forward to more. Recently, I have had to let a lot of new music grow on me. I wonder how much this will continue to get better as I listen to it.